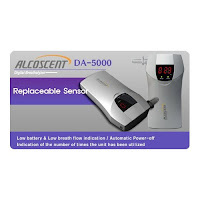 Alcohol breath tester ,Breath Analyzer Great tool to have in your car ,test yourself before you drive . Take responsibility and drive safer knowing your alcohol level. Taking this step before you hit the road may save you and your family, highly recommended! Its a very good invention.I just hope that people become more responsible and make use of this instrument seriously whenever required.Because the safety of all the persons in any vehicle is in the hands of the person driving the vehicle.